Here’s a pop quiz: What U.S. city is home to the nation’s largest repertory theatre company? This company has a combined acting troop, production crew and administrative staff of 500 professionals—not to mention a legion of volunteers—that presents up to 800 performances of eleven plays with an annual audience of about 400,000. It’s got to be New York City, right? Wrong! The answer: the small rural town of Ashland, Oregon. Nestled in the south end of the Rogue Valley near Interstate 5 and the California border, The Oregon Shakespeare Festival (OSF) annually produces Shakespearean dramas and comedies, in addition to classical and contemporary plays with an annual operating budget of $26.8 million. OSF is the largest regional repertory theatre in the country and the second largest employer in Ashland, second only to Southern Oregon University. This past week, I had the pleasure of seeing a wonderful performance of Pride and Prejudice, directed by OSF’s Libby Appel. This is stunning and unique period adaptation of Jane Austen’s 19th century classic. 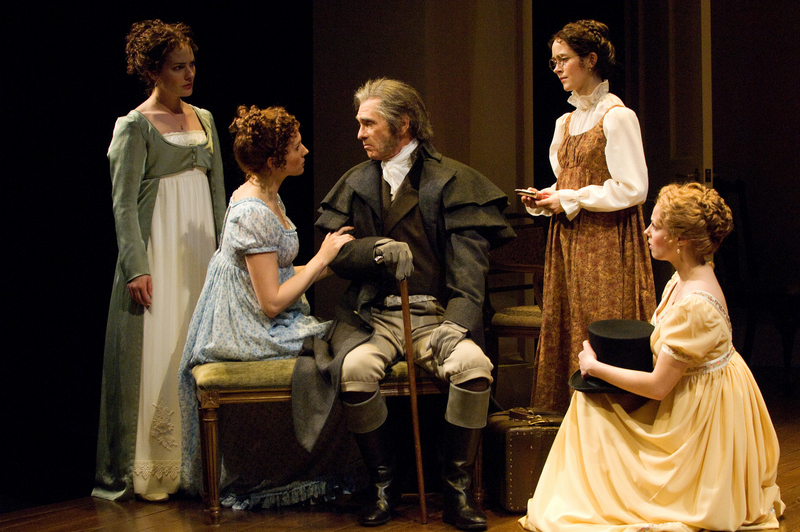 The play does not use the narrative voice, as is the case in Austen’s novel and many other play adaptations. Instead, the play unfurls the interwoven desires of each character in a sprightly drama. The characters are captivating as the outwardly snooty Mr. Darcy woos the shrewd Elizabeth Bennet. Hilariously funny portrayals of the Rev. Collins and the matchmaker mother, Mrs. Bennet, are superbly cast and serve both as comic relief and reminder of Austen’s witty criticism of 19th century English class system. The staging is highly effective with clever lighting and character tableaux, which transform the actors in time and space—without the need for elaborate scene changes. In the end, love prevails while preserving every parent’s wish to see their offspring marry well — or at least with the family’s dignity intact. Pride and Prejudice runs through October 31, 2010. The Oregon Shakespeare Festival is celebrating its 75th anniversary this year. If you’re traveling to Oregon, OSF is a must see experience. Three OSF theaters await you with outstanding plays and backstage tours. Ashland is within reasonable driving distance of major cities like Eugene or Portland. I’m told serious theatergoers spend an entire week in Ashland, taking in as many as nine plays! Bed & Breakfasts and fine restaurants abound. For more information and the current season’s listing, check out www.osfashland.org. For a glimpse at the OSF campus, view my photos on Picasa Web Album.